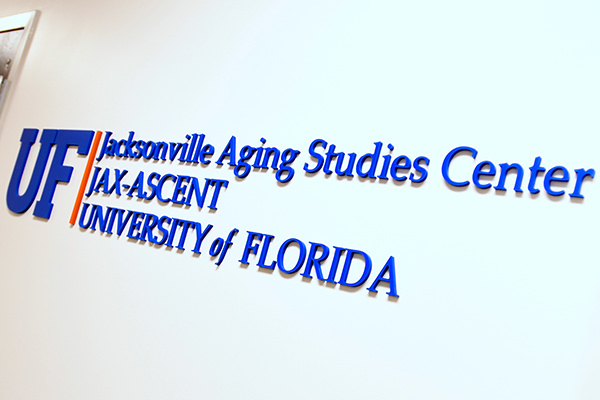 The clipping of a blue ribbon Friday, May 11, marked the official opening of the Jacksonville Aging Studies Center, or JAX-ASCENT, which will serve as a hub for groundbreaking research on aging in Northeast Florida. 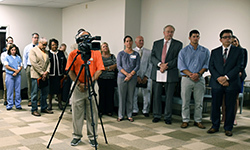 University of Florida faculty physicians, researchers, other personnel and special guests gathered for the event on the second floor of the Professional Office Building on the UF Health Jacksonville campus. That’s where researchers will soon conduct behavioral, nutritional and pharmacologic clinical trials targeting older adults, particularly racial minorities and people of low socioeconomic status. Researchers will also study social determinants of health that contribute to chronic diseases and functional decline within those demographic groups. 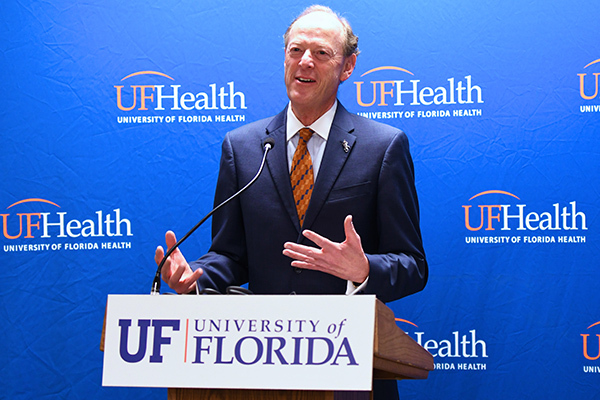 On Friday, UF Health leaders from Jacksonville and Gainesville addressed the crowd and took part in the ceremonial ribbon-cutting. Speakers included David S. Guzick, MD, PhD, senior vice president for health affairs at the University of Florida and president of UF Health. Organizers are using a five-year, $3.6 million award from the National Institutes of Health to develop the center, which includes interview and examination rooms for health assessments, physical performance measures and cognition, memory, body composition and strength tests. Space renovations began in December and wrapped up in March. A key component will be the participant registry. JAX-ASCENT wants to register 1,000 people each year — adults 60 and older who will receive information about the latest research being conducted. If they qualify, they may be invited to take part in a variety of studies. There is no cost to participate and compensation may be provided, as well as transportation to and from the center, if necessary. JAX-ASCENT was specifically created to provide an integrative physical and intellectual environment in which trainees at all levels and scientists from diverse disciplines can interact and conduct clinical and behavioral translational research on aging and independence of older adults. 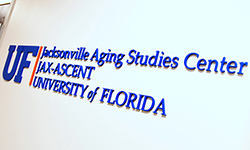 JAX-ASCENT members will collaborate with UF faculty from the Gainesville campus, including personnel from the Institute on Aging and the Claude D. Pepper Older Americans Independence Center. Leon L. Haley Jr., MD, MHSA, dean of UF COMJ and CEO of UF Health Jacksonville, said the opening of JAX-ASCENT is critical in furthering the campus’ vision of becoming the region’s most valued health care asset, with research being a major component of that aim. Bottini says older adults, racial minorities and people of low socioeconomic status have been underrepresented in clinical research, making it more difficult to develop the best prevention and treatment approaches to assist them. 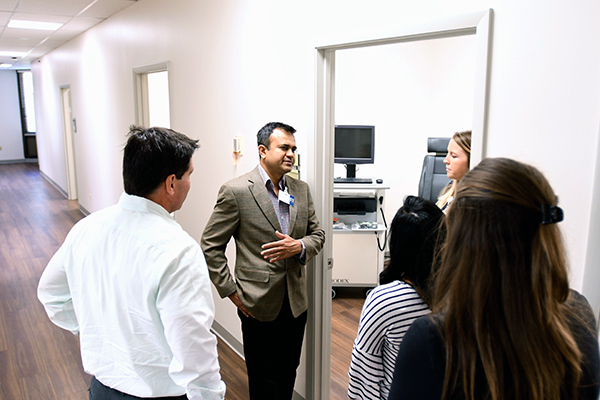 Administrators believe Jacksonville is an ideal location for an aging studies center because of the high concentration of residents who fall into those demographic groups. The first planned JAX-ASCENT study is a trial on age-related muscle mass loss. When the center becomes self-sustaining, there may be at least 10 research studies ongoing at any given time. For more information or to sign up for the registry, visit UFJaxAgingStudy.com or call toll-free 866-386-7730. 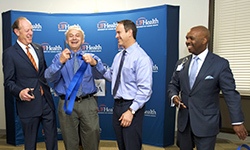 UF Health leaders celebrate during a ceremonial ribbon-cutting to mark the opening of the Jacksonville Aging Studies Center. 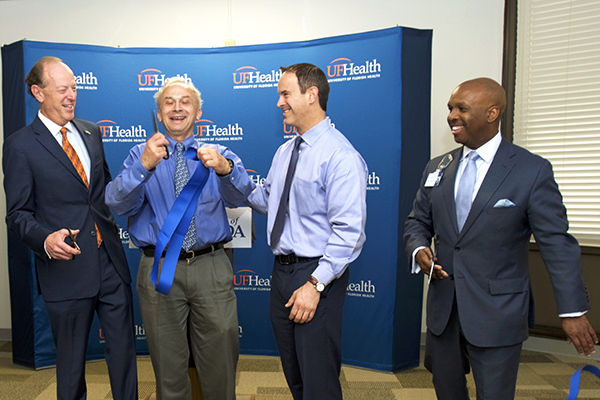 Pictured, from left, are UF Health President David S. Guzick, MD, PhD; Marco Pahor, MD, director of the UF Institute on Aging; Steve Anton, PhD, chief of clinical research in the department of aging and geriatric research; and Leon L. Haley Jr., MD, MHSA, dean of UF COMJ and CEO of UF Health Jacksonville. The Jacksonville Aging Studies Center, or JAX-ASCENT, is located on the second floor of the Professional Office Building on the UF Health Jacksonville campus. 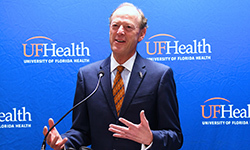 David S. Guzick, MD, PhD, senior vice president for health affairs at the University of Florida and president of UF Health, addresses the gathering at the Friday, May 11, JAX-ASCENT ribbon-cutting ceremony. 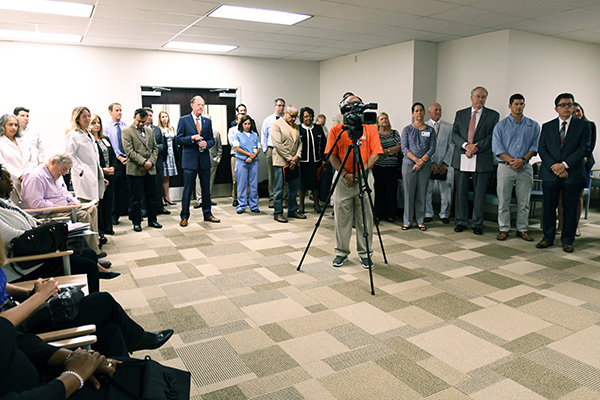 UF Health personnel from Jacksonville and Gainesville were among those who attended the ribbon-cutting ceremony. 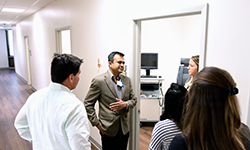 Staff treated senior leadership and guests to a tour of the renovated space, which features interview and examination rooms for those who participate in clinical trials.